Spray Paint Door Knobs?? YES YOU CAN!! So easy, you won't believe it! 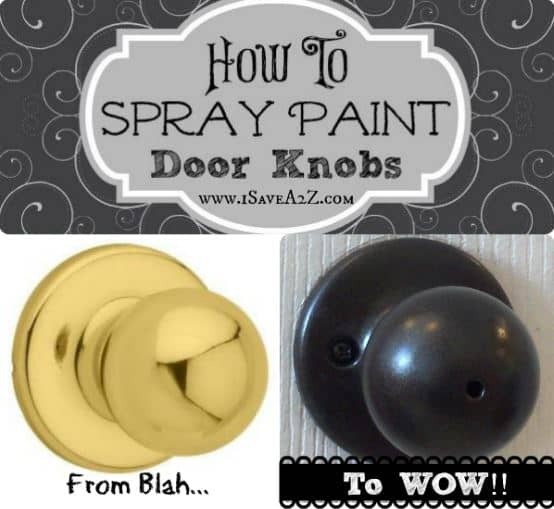 How To Spray Paint Door Knobs! I have been wondering if it was really possible to Spray Paint Door Knobs. Well, I am happy to report YES YOU CAN!! Spray paint has quickly become one of my favorite crafting tools. I am using it everywhere. But actually spray painting door knobs all throughout my house is one of my best projects so far! We have an older house which we have been working on and updating forever. There has always been one big thing that bothered me about the house….gold door knobs! Not just the knobs, the hinges and locks too. They were all gold and I couldn’t stand it! We checked at our local hardware store to see what it would cost to replace all of these. 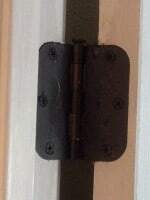 We did find a pack of 12 Oil Rubbed Bronze hinges for only $23.00. Not a bad price, and I could live with that. BUT…when we priced the door knobs, they were up to $22 EACH! It would have cost me over $200 to put these in. So I had to find an inexpensive way to do this! 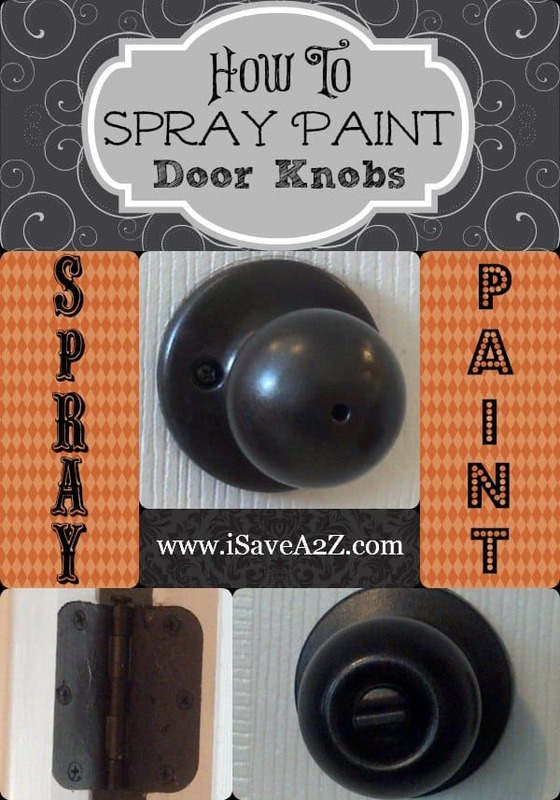 I read where a few people had simply spray painted their door knobs. Could it be that easy? Will it look okay? Will the spray paint make the door knob feel funny? I was going to have to take all of the doors down and the hardware off either way, so the labor was the same. I quickly decided that I HAD TO try this. We headed up to the hardware store and purchased 3 cans of Rust-Oleum Oil-Bronzed Spray Paint. It only costs about $7 per can and this was the only thing I had to buy for this project! This is the color we chose, but they also have nickel and stainless steel. To get started, we took all the doors down, removed the screws, knobs, locks and hinges. I laid a big piece of cardboard on our table outside and laid everything out. The cardboard works great too because you can stick the screws in it so that they are standing up to spray paint the tops! Then just spray light even coats until the hardware is covered. We tried to do one door at a time and kept all of the pieces together for each door. To allow for drying time, we sprayed one set of hardware and then hung a door that was already done. By the time I got the door hung, the last set I sprayed was dry! We had 9 doors in our house to do and got them all sprayed and hung back up in one day. All of this for about $21!! HUGE SAVINGS!! We only used a little bit of our 3rd can of spray paint so we also sprayed an old bathroom light fixture and an outside light! Everything turned out beautiful. Oh! And to answer my questions about the spray painted door knobs, it looks great and feels fine. It’s smooth and feels just like a bronze colored knob would. By Jennifer on October 7, 2013 Crafts, Frugal Living, Home Improvements, Money Saving Tips, On The Cheap, Redecorate. Should we have put a clear top coat on after spray painting? I would definitely clean everything with a good degreaser (or at least alcohol) and wipe/rinse that off as well and dry thoroughly before painting. Lots of grime gets all over the knobs and cracks that will hinder a good bond for the paint. Hinges have been sprayed sometimes and have metal grit from use if they haven’t. Also, you could do a clear topcoat over those keyhole areas so it helps protect from scratches from the key, and periodically (once a year at least) clear coat again at the keyhole. I want to do this on an exterior door but am afraid the keyhole won’t work anymore. Any ideas? That is a great tip! Non of the doors I spray painted have key holes, so I was lucky and didn’t have this problem. The door knows still turned? They weren’t painted into a stationary position like when windows get painted shut? They still turn fine. A few of our also have the small turn lock on the knob, and those also turn well. Hi, could you please let me know which Rust-Oleum oil-bronzed spray you used. There seems to be several types to choose from and I really like the colour and finished that you have used. Hey Barb! I used the Metallic Paint and Primer in One spray. Oil Rubbed Bronze was the color we picked. The metallic spray isn’t real shiny and I was worried about how it would feel, but it turned out great. 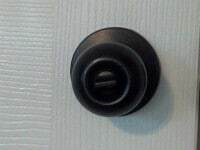 Did you try any of the door knobs with the pop in/out locks? I was worried that the popping would wear the spray paint off… We have the horrible 90s gold knobs and hinges throughout our house too. No, we didn’t try the pop out locks. I’m not sure about that one. Did you have to do any prep work before spraying? Cleaning, light sanding, etc.? If there is any oil or grease on the hinges, you may want to wipe as much of it off as you can. I have seen other people do some light sanding on the knobs and hardware but we didn’t do any of that and they have held up great. 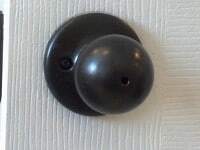 Curious how the painted knobs have held up under everyday usage??? 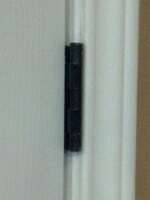 Has the painted rubbed or worn off on the ones that are used everyday such as a bathroom door? They have held up really well…and I have a 6 and 3 year old running around. I did scratch one with my wedding ring, but just sprayed some paint on a paper plate and touched it up with a small brush.